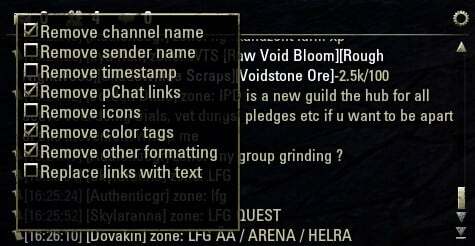 This simple addon adds a small button before each chat message that opens a textbox and allows you to copy the message to the clipboard by pressing ctrl+c. Left click shows the popup which contains the message, right click shows a settings menu which let's you decide which parts of the message should be removed or replaced with plain text (powered by Garkin). *NEW* You can also shift+click on the button and it will ask to open an external link for google translate. In addition there is a slash command "/m2c" which allows you to copy text from the control you are currently pointing your mouse at. This does not work with every text, but a lot of things can be copied. There is also special support for books and mails to copy them completely. Is there anything broken? It works fine for me. Can I just say thank you, a million times over for this addon? It has been a lifesaver for me. I recommend it to my guilds all the time. Last edited by calia1120 : 04/28/16 at 07:53 AM. This addon has stopped working for me in 2.1. Anyone else experiencing this? If so, is it possible to get it updated? Someone else reported it too and it also stopped working for me, so I will be uploading a fix soon. Thanks for the quick fix. Less than 24 hour turn around. I am an officer in a roleplaying guild presently active in ESO. As you can probably guess, RP is an unpredictable affair, and since some of our members are extremely skilled, we occasionally get interactions that we wish to save complete for later use, perhaps in writing fanfiction. However, at present it seems that the only way you can save the complete contents of a chat box is to screen-capture it over and over again while scrolling down in the text. Your addon is invaluable in copying single messages. Would it be possible to add a feature that would allow dumping the entire contents of the chat window, from beginning to end, into a file or window from which it could be recovered? 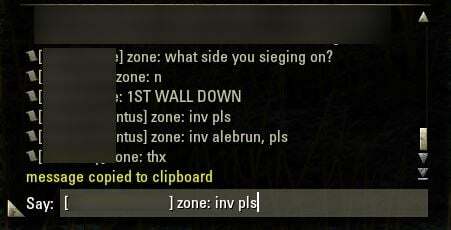 It would also be useful if such an action could be set to perform automatically when the chat window is closed, say on signing out one character and signing in another. At present, it is infuriatingly possible to lose vital content when absent-mindedly switching characters, since the entire chat window is flushed. If the contents of the last chat window were automatically read to a file when the window was closed, this sort of accident would become less possible. Last edited by QuadroTony : 05/12/15 at 03:09 PM. any chance to get an ability to copy text from Combat log statictis addon's window pls? Working Great again thank you for the quick response and a great addon! If you like any part of modified code, feel free to use it. I will definitely make an update with Garkin's modified version, but I want to review the code first and am busy with another addon atm. I have updated Chat2Clipboard in my dropbox folder again. At first I was trying to fix issues with additional chat containers and due to fixed code it now can copy all messages, including system and debug messages.